BAFTA-nominated composer Sheridan Tongue is one of Northern Ireland’s most successful television composers, best known for working on award-winning drama series and documentaries that have reached a global audience. 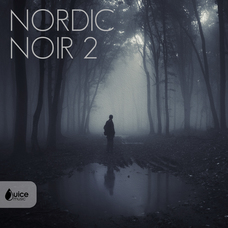 Here Sheridan talks about his interest in Nordic Noir and what inspired him to create this album. I remember vividly the first series of the Danish series The Killing, and ever since then I have been captivated by the world of Nordic Noir. It is a genre often referenced in TV drama and what interests me the most is the music. I always wanted to compose an album in this genre. It is a genre and style that I am naturally drawn to…I don’t know if it is my Irish roots but I love melancholy, ambiguity, space, darkness, textures and beauty and I wanted the tracks to encompass all of these aspects. Working in television drama I have been fortunate to work with many great directors who have a passion for mood and texture in their work. It has been inspiring to work with them and I have learnt a lot over the years about music and picture and how powerful the combination can be when the chemistry works. When composing to picture it is often about creating an atmosphere, and I love the process of immersing myself in a new soundtrack for a film, television drama or documentary that embraces this idea. Here is a short film about my musical approach for the album that I made with director Alexander Luchita: it actually snowed on us in London as we shot the ending street footage…perfect for a Nordic Noir album!